Wild Tamer is a simple yet challenging game for mobile that tasks the player to uncover or discover all the unique animals and tame them. In the game, you play as Druid who lives in a cave. You will start your journey from Wildland map. Wild Tamer game features many more locations such as Necro Cave, Mermaid Island, Draco. You will have to clear the wildland map first to unlock the next area, and the same rule goes on. There are loads of animals(secret, unique, elite, boss) at each map. If you are having the trouble understanding the game’s mechanics or looking for tips, cheats & stratgey, you are at the right place. Our Wild Tamer guide and Wild Tamer tips, cheats & strategies will help you. Things To Know In Wild Tamer Game! Wild Tamer is all about building the team of animals to collect rare and unique/elite animals. Since rare or elite animals are very powerful, you will have to level up tamed animals, equip/upgrade the weapon, armor, and accessory to improve the attack, HP, movement stats. You can find rare or powerful animals in the night(to check the time period, pay attention to the time meter at the top-right corner, near minimap). If Druid has poor stats or low-level animals, then he would not be able to tame those animals. But a powerful animal can help you in taming loads of animals in no time. That’s why, good equipment, high-level animals, stats matter a lot. How To Tame Animals On The Map? Taming an animal is quite simple; all you need to do is reduce its HP to 0. You can do it by dealing damage(go close to the group of animals to start fighting). Keep in mind that you can tame a certain number of animals on the map. You can check the maximum limit at the top-right of the screen. And, also keep in mind that you can not tame all the animals. Only animals with a cobweb mark can be tamed. If there is no mark on the animal, then you will get the coins. If there is a cobweb mark on the animal, you will get the two options; tame(cobweb icon) and material(bone, feather, fang). To tame, tap the cobweb icon. How To Get Animals For The Party? To unlock an animal, you must kill it a certain number of times. For example: To get Toad in Wild Tamer, you must kill Toad on the map three times. The game allows you to add up to five animals to the party. Go to the home or lobby and head to the animals menu(Navigate druid to the highlighted circle next to the portal, bottom-right corner). There you can equip, level up animals. 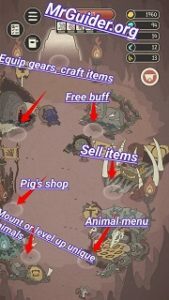 How To Sell Animals In Wild Tamer? Selling animals is one of the best ways to earn loads of gold in Wild Tamer. You can sell the tamed animals. Go to the map -> tame animals and return to home manually(don’t use the home button feature). After it, move to the highlighted circle next to Pig’s shop. 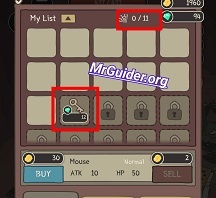 In (my list section), select the animals and hit the sell button. How To Increase The Tame Limit? When you start the game, you have only 10 tame slots. So you can tame up to 10 animals at a time. If you want to increase the limit or want to tame more than 10 animals, then you will have to buy more slots from the pig’s shop. It will cost you diamonds. What Are Teleport Points? How To Wrap? When you unconscious the animals by fighting, you get two options; one option allows you to tame, while another one gives you an item. It could be a bone, fang, feather. These items are required to teleport from one point to another. 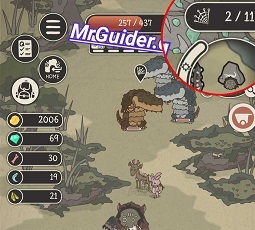 On the animal hunting screen, at the top-right corner, zoom in to the mini-map by tapping the magnifying glass icon. There you can check all the teleport points on that area. These are checkpoints. If you Druid gets died after exploring a larger part of the map, you can use these teleport portals to directly move there when you start again. So you must enter these portals to save progress. To teleport, simply head to any teleport point -> tap the icon -> select the checkpoint/teleport points to move there. Long-distance checkpoints cost you more items. What Are Those Caves In Wild Tamer? On the map, you can find a number of caves. On the mini-map, these caves are denoted as ? mark icon. If you enter these caves and defeat all the animals, you will earn loads of gold, precious items. How To Increase The Power Of Druid? You should pay attention to the Druid’s stats. Your game will be over as soon as Druid gets died. To explore more, you must increase the power of Druid in Wild Tamer. How to increase? Go to the home -> head to crafting menu -> there you can buy equipment; weapon, armor accessory and combine material. Buying equipment will cost you bones, feathers, fangs. How To Level Up Animals? To level up an animal, you must kill it a certain number of times. In the animals menu, you can check how many times you have to kill a specific animal to reach the next level. Leveling up animals increase attack, HP stats. So that’s all for now as Wild Tamer Guide. Let’s take a look at our top Wild Tamer tips, cheats & strategies! Diamond is one of the main in-game items in Wild Tamer. You can use it to buy unique animals, for artifacts, gacha items, increasing the tame limit, and in many tasks. If you want to earn diamonds for free, then search for diamond mines on the map. 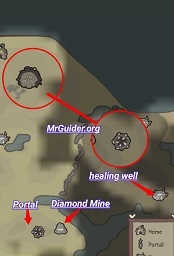 As you explore the map, you will find these mines. 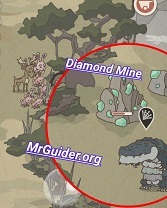 Go close to these mines and watch the video ad. You can earn up to 10 diamonds. Additionally, for the exact location, go to the rock points on the map. Usually, these mines are guarded by elite animals. If you have a good team, then make sure to go there and defeat guards. And, then mine diamonds from the diamond mine. If druid’s health is very low, then head to recover points(healing well on the map). Go close and watch the video ad to recover his health. You should not attack a large group of animals. Instead, focus on the small groups. However, if you have high-level animals, then you should not have the problem. Change your way if there is a large group nearby. Entering the teleport portals or checkpoints saves your time when you start exploring again. You can teleport between checked points by spending items; bones, fangs, feathers. The player can earn precious items, a large amount of gold by killing all the animals in the cave. After getting the reward once, you will have to wait for certain hours. So make sure to visit cleared caves often. The more tamed animals you have in the battle, the better would be winning chances. So make sure to increase the tame limit to tame more animals for boss fights. Go to the shop menu -> head to the diamonds tab -> there you can claim free gold, bones, feathers, fangs by watching the video ad. You would not be able to progress fast if you are not focusing on the team. Make sure to upgrade the Druid’s gears and level up animals. Sometimes, in the battle, you interact with two guys with a cart. 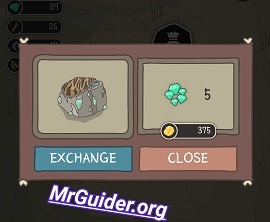 If you interact with them, you will get the deal; it could be a tamed animal, diamond deal(exchange coins for diamond), employing animal, and more. Animals in the team respawn after a certain amount of time in the battle. For example; you lose the snake in the battle(from the team), then simply wait for a few seconds until the snake respawns again. You can check the resurrection time at the top of the screen. In case you have lost all the team members, then find a safe place and wait for them. You can speed-up by watching a video ad. Hunting in the night, without the torch could be dangerous. You can buy the torch in the battle by tapping the fire/torch icon near mini-map. It will cost you coins. So these are our top Wild Tamer tips, cheats & strategies. If you more tips & trick or have any question, feel free to comment below.